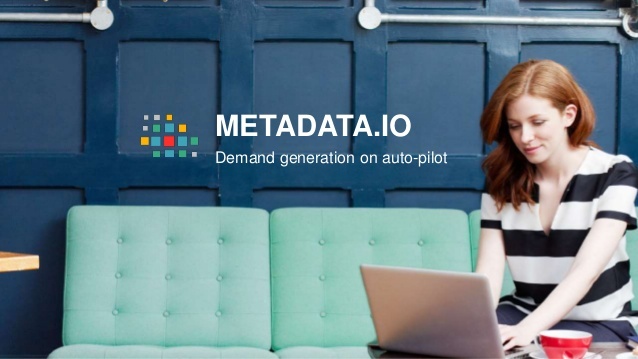 San Francisco, CA, September 6, 2016	(Newswire.com) - ​​​​​Metadata, a San Francisco based technology startup, today announced it raised a $2 million seed round. The round was led by Hillsven Capital with participation by Greycroft Partners, 500 Startups, and Right Side Capital Partners, as well as various angel investors. Metadata has developed a patent-pending intelligent demand generation platform for B2B marketers who want to optimize their marketing spend and reduce customer acquisition costs by generating and targeting new pipelines of qualified prospects. The machine learning driven platform combines first-party data from internal CRM, marketing automation platforms and hundreds of third-party data signals to build active personas based on existing accounts and leads. Net new qualified prospect lists are then constructed by pulling matches from a database of hundreds of millions of people sourced from business data sources that include ZoomInfo, Clearbit, and FullContact. The lists of qualified prospects is then used for relevant, highly targeted paid ad campaigns on display and social networks. With the new round of funding, Metadata plans to accelerate its rapid growth by developing and scaling its sales, marketing and development efforts. The capital will also allow the company to expand its integration with complementary SaaS products. The platform has native integration with systems such as Salesforce, Hubspot and other leading marketing technologies. Metadata was founded in 2015 by Gil Allouche and Yan Manevich. Metadata fuels your marketing campaigns with opt-in marketing qualified leads using patent-pending technology that taps into your CRM data to automatically analyze and map your target persona. Metadata then uses look-alike modeling to target relevant prospects to optimize your paid media spend and boost conversion rates by 3-5X. Among our featured customers are Datawatch, AtScale, Concurrent, Cisco, UBM, Datawatch, OOMA and others.